This is the third collection of tunes issued by the indefatigable John Offord, whose previous publications include the groundbreaking and hugely influential John Of The Green: The Cheshire Way. Here are no less than 480 tunes from the Lake District area - the book could just as easily have been called Bonny Westmorland - and they cover a range of types and styles. All the music contained here is already available on the internet, mostly due to the fantastic work of the team behind the Village Music Project, but as anyone who has consulted this will know, it is not particularly easy to work with if you are a time-strapped performer. Amongst the gems there is lots of duplication, some very poor and uninteresting material and various oddities of transcription (the original manuscripts that is, not the VMP versions!). So it’s wonderful to have Offord’s sure hand guide us to a selection based on “quality and because many seem to have been locally composed” and they live up to this claim, being well worth considering adding to your repertoire. There are notes on the tunes and the way they have been presented and an introduction pointing up the similarities in material between northern England, Scotland and Ireland. I should have liked the introduction to be longer, but this is purely selfish as I find what he has to say about both the material and playing styles so interesting. There are a few typesetting errors which could easily have been fixed, but this will not affect your enjoyment of what is a particularly fine and useful tunebook. There are riches here. Book Review by Steve Matthews of Bookends. 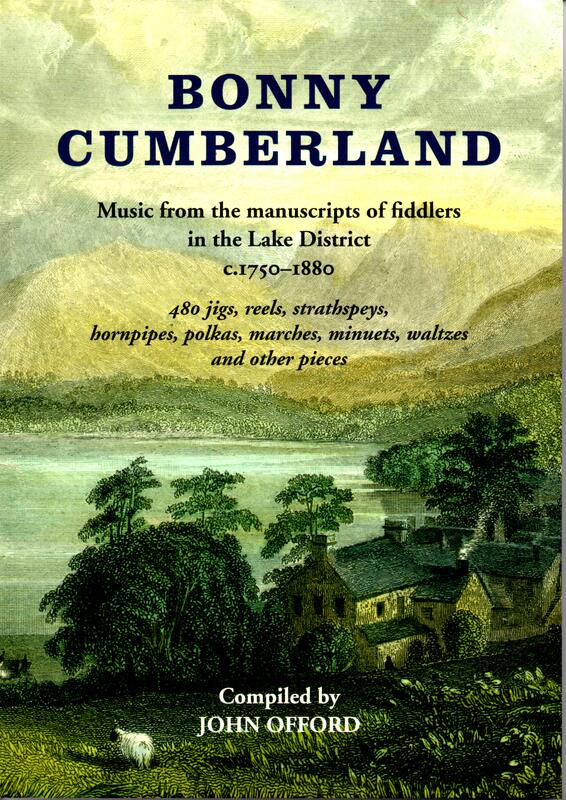 Bonny Cumberland: Music from the manuscripts of fiddlers in the Lake District c.1750 – 1880. compiled by John Offord. Green Man Music. £18.50. Tom Moses from Lanercost supplied the instructions for dancing the Cumberland Long Eight. The four couples stand facing each other. “First man leads in a single cast ‘out’ of the set to the bottom, while first lady leads the ladies in the same on the side. Partners meet up at the bottom and dance (perhaps swing) to the top, doing a double step.” And so the dance continues to a 32 bar reel. Or they might have danced a Cumberlandd Square Eight, or a Three Meet or a Cottagers or one of many other formations. Whatever the dance the fiddler played, repeating the reels, jigs, strathspeys, hornpipes, polkas, marches, minuets and waltzes until the company was exhausted. There’s 480 tunes in this wonderful compilation by John Offord. The fiddler and other itinerant musicians were to be found at every “wedding, loosening, tea-party, ‘auld wife’s hake’, young folk’s assembly, hay fair, flower show and friendly society’s hall and wherever the people of the Lakes got together to enjoy themselves, usually in the village inn or tavern. The vigour, of course, has departed long ago with the old dalesmen, but the tunes have survived in remarkable numbers. The Lakes were peculiarly well-placed for a rich mixture of music. Immigrants from Scotland and Ireland and elsewhere in the north of England, brought their tunes and their dances. The area was, by its very nature conservative, and so much of the tradition was preserved. They’re wonderful tunes, full of life and energy and the character of the county. The names themselves convey something of their qualities. There’s ‘Bonnie Cumberland’ and ‘Bonnie Westmorland’, as you might expect. But there’s also ‘A Touch Under the Blanket’ and ‘Willie is a Wanting Wag’. The tunes were known all over the Lake Counties. There’s an ‘Oughterside Rant’, ‘The Whitehaven Volunteers’, ‘Allonby Lasses’, ‘Trip to Cartmell’, Ullswater Regatta’, ‘Brampton Reel’, ‘Calgarth Hornpipe’, ‘Briggham Hornpipe’ and even a hornpipe for the ‘Bonnie Lasses’ of Keswick. ‘The Hieland Man Came over the Hill’, ‘Highland Laddie’ and ‘Jimmy o’the Glen’. And there’s many pictures of the merry goings-on as the fiddlers fiddled: ‘The New Way of Wooing’, ‘Maidenhead is a Folly’, ‘Kiss Her Sweetly’, ‘Squeeze me Softly’, ‘Bonny Lass to Marry Me’ and even ‘Lasses Keep Your Legs Together’. John Offord has collected his tunes from the rich manuscript sources. In Carlisle Record Office is a manuscript of tunes that Joseph Barns of Abbeyholm began compiling in 1762. Mathew Betham, a Yeoman farmer of Towcett, Newby, north of Shap, kept a tune book in the early nineteenth century. The Browne family, prosperous farmers from Troutbeck, left five manuscripts. And there were others from William Irwin and his pupil, Henry Stables, of Langdale, John Rook of Waverton, and several found among the Senhouse papers. Together they constitute a remarkable collection and John Offord is to be congratulated on preserving a wonderful tradition. Delivery: For customers in the UK the normal delivery time is 3 working days.